Race to Equity is a review of the success and failures of Toronto District School Board (TDSB) of Education’s pursuit to provide equitable education. It presents an inside view of “experiments, success and mistakes” that have occurred in the attempt to provide all inclusive education to a diverse student body. The author McCaskell, had worked with TDSB in Department of Equity as Student Programme Worker to aid the development and delivery of anti-racism, anti-homophobic and equity programmes. In Race to Equity he uses both his personal experience as well as political theory’s to show the institutional and social transformation that has taken place. 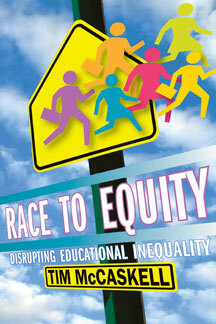 For more information on Race to Equity visit http://www.btlbooks.com/New_Titles/race_to_equity.htm.